I don’t know about you, but I get a little tired of the traditional roasted root vegetable winter salad. There are so many more options! Like most salads, I don’t exactly have a recipe, rather just a list of ingredients and simple preparation techniques. Salads are flexible! Chop up the vegetables, toss them with the oil and garlic cloves, and pop in the oven at 400 degrees to roast for about 20 minutes. Toss mid-way through the roasting, and check. 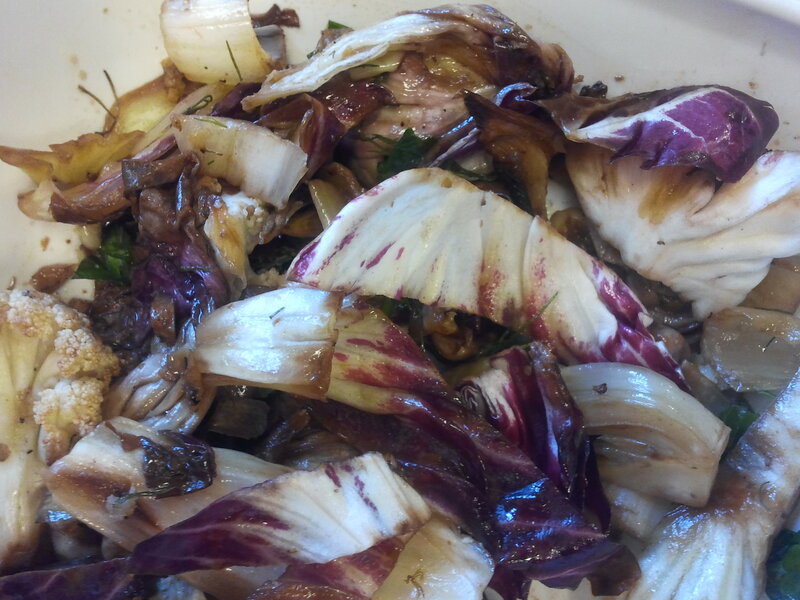 You want the fennel to soften, and the cauliflower to slightly brown. Toss the vegetables into a large bowl, reserving the roasted garlic cloves. Toss the above ingredients into the big bowl with the roasted vegetables. Because roasted radicchio tends to get brown and limp, I think it’s nice to add a little fresh (and some endive, if you have it) for crunch and color. The fennel fronds and parsley add a nice bust of color and a bright flavor. In a small bowl, mash the roasted garlic cloves, and whip with some olive oil, good quality balsamic vinegar, sea salt, fresh ground pepper, and the zest of one lemon. Toss with the salad and – viola! Complex flavors, seasonal produce, and a salad strong enough to hold-up in the fridge for a few days!